The Dazzle Me slot has a lot going for it, in that Net Entertainment have combined features of two of their much loved slots (Twin Spin and Starburst), and blended them together in this slot machine game. 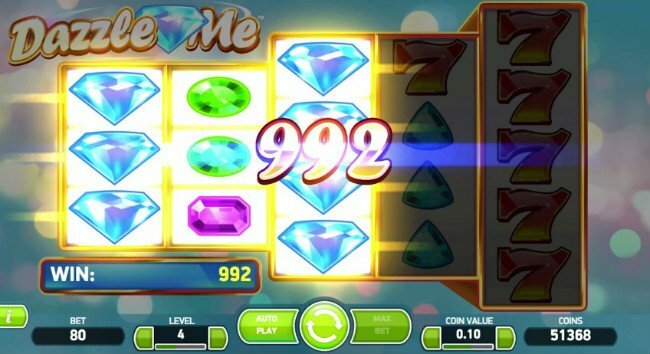 Dazzle Me is a brand new video slot, released by Net Entertainment. 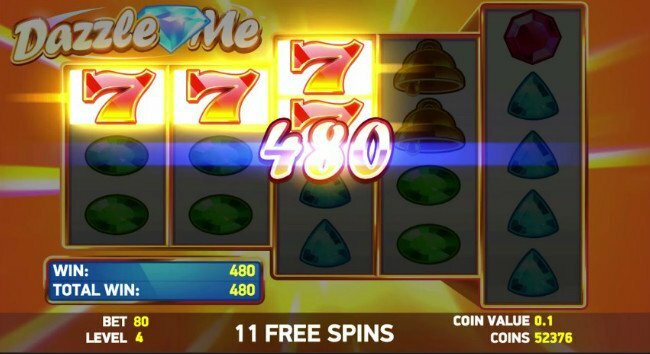 The slot features elements which may be familiar to anybody who has ever played Twin Spin, or Starburst before, and the Dazzle Me slot machine can offer you 76 paylines to win on, as you’ll see in this Dazzle Me slot review. The Dazzle Me slot graphics aren’t going to make you jump for joy. They are decent, but not exactly original, or out of this world. Your favourite gemstones and diamonds are all presented to you on the reels, along with the famous number 7 symbol, from the classic slot gaming world. In effect, the Dazzle Me slot is a classic slot in graphical design, played with video slot features. Players will have a good degree of control over their bets in the Dazzle Me slot game. The game permits you to adjust your coin values from 1p up to £1 in total, and you should be able to stake up to 10 coins per payline. Paylines are fixed into place, though. A total of 76 of them sit upon the slot’s 5 reels. As you can probably tell, this slot won’t exactly cost you a fortune to play. Wild reels are a part of the many Dazzle Me slot bonuses. This feature is quite similar to the one which appears in Starburst, and they can replace all symbols in the game, save for free spin icons. A good run of form with multiple wilds could see players win big with these symbols. Wilds may appear randomly at the start of any spin, and can appear on all of the reels. Wilds aren’t the only icons which appear stacked in the Dazzle Me video slot. In fact, all of the icons in the game appear stacked, on all of the reels. This can only boost your win even further, especially with so many paylines to win on. With 76 ways to win, Dazzle Me Slot offers a nice mix of gameplay and pay. A free spins scatter symbol is easy to spot in this slot, since it has “free spins” written across it. Land 3 or more of them in any positions on the reels to trigger the bonus round. Once the bonus round has been triggered, the player will land in a free spins bonus round. More often than not you’ll only find 3 free spin icons, although, the more you find the more free spins you’ll start off with. The main feature in this bonus, though, is the Linked Reels feature. This is similar to what appears in Twin Spin. On any spin, reels can have their symbols duplicated, meaning you stand a better chance of landing bigger wins. Up to 5 reels could be linked and display the same symbols at any one time. 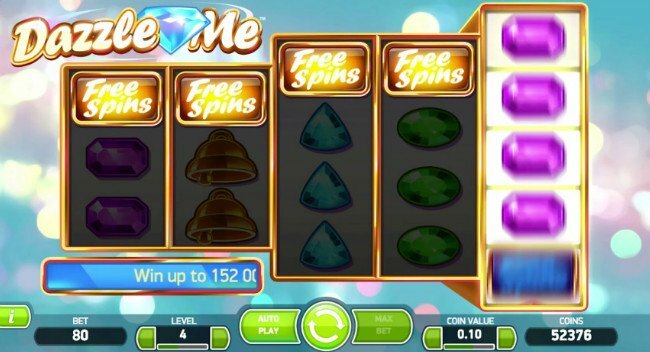 The Dazzle Me slot has a lot going for it, in that Net Entertainment have combined features of two of their much loved slots (Twin Spin and Starburst), and blended them together in this slot machine game. True, that doesn’t make Dazzle Me slot machine terribly original, but it does offer more than decent pay-outs for minimal stakes, and that certainly counts for something.